Adolf Hitler's Mein Kampf, with critical notes by scholars, is to be published in Germany next month - for the first time since the end of WW2. The Institute of Contemporary History (IfZ) in Munich says it will print up to 4,000 copies with some 3,500 notes. IfZ director Andreas Wirsching says the text with expert comments will "shatter the myth" surrounding the manifesto. But the move has been criticised by Jewish groups, who argue that Nazi works should never be republished. 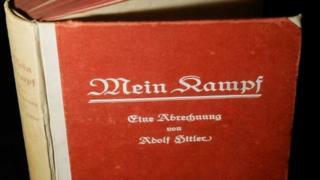 Mein Kampf (My Struggle) was originally printed in 1925 - eight years before Hitler came to power. After Nazi Germany was defeated in 1945, the Allied forces handed the copyright to the book to the state of Bavaria. The local authorities have refused to allow the book to be reprinted to prevent incitement of hatred. Under German law copyright lasts for 70 years, and so publishers will be able to have free access to the original text from January. However, German officials have said they will limit public access to the text amid fears that this could stir neo-Nazi sentiment.